Quetta, September 27, 2018: Commitment from media is critical for mobilizing and garnering affirmative action to defeat malnutrition menace in Pakistan. This was discussed in a meeting organized by Scaling Up Civil Society Alliance Pakistan (SUNCSA, Pak) in collaboration with Nutrition International and Pakistan Poverty Alleviation Fund (PPAF), member and Chair of the SUNCSA Executive Council. 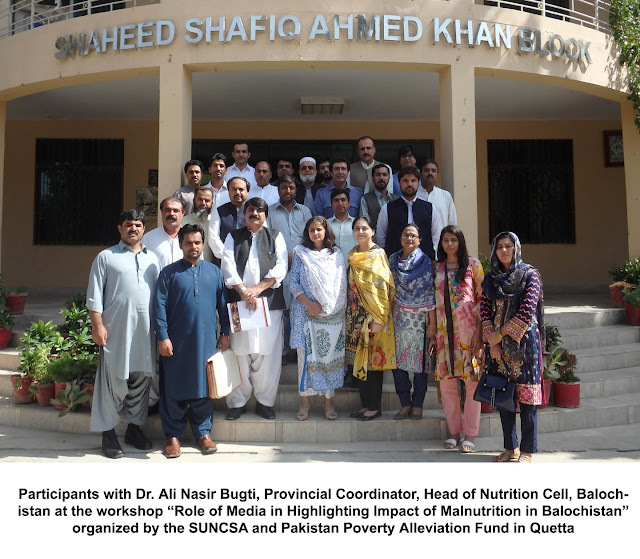 The participants from media pledged to actively play their role for prioritizing nutrition agenda at the policy and programme levels in Balochistan as well as raise public awareness on the adverse effect of malnutrition to bring about behavior change. Speaking on the occasion, Dr. Ali Nasir Bugti; Provincial Coordinator and Head of Nutrition Cell; Government of Balochistan highlighted the initiatives taken by provincial government to address the malnutrition situation in the province on priority basis. He shared with the audience various initiatives taken by the Nutrition Cell to address the issue in various districts of Balochistan He said, “Lack of human resource is one of the biggest hurdles in reaching out to local communities suffering from malnourishment. The issue of malnutrition cannot be tackled individually; concerted efforts are required from all stakeholders including the government, civil society, private sectors and media for improving the situation of malnutrition in Balochistan”. He elaborated the role of the Balochistan Nutrition Program for Mothers and Children and the support extended by the donor agencies, in this context he gave reference of different strategies that have been developed at the provincial level. He said more than half of children under five in Balochistan are stunted which means that they are short for their age due to chronic malnutrition, a condition that has lifelong consequences on physical and mental development. He also added that Balochistan’s government is committed to eliminate the malnutrition crises from the province and has been taken various steps to address the menace of malnutrition. Dr. Ali Nasir Bugti appreciated the meaningful presence of print and electronic media and said that they can play a powerful and active role through sustained focus on nutrition reporting using their platform. He urged them to highlight the malnutrition issue using their platform, he added. Ms. Aliya Habib, Project Manager, SUNCSA, Pak/ Nutrition International presented the overall context of malnutrition and status at national and Balochistan level. She highlighted that malnutrition not only effects individuals but has dire economic and developmental impacts for the community and nation as well. She added that Balochistan has particularly high rate of stunting, where more than half of children under-5 (52%) are stunted while the prevalence of Wasting is 16 percent in the province as compared to 44 percent and 15 percent respectively of the national average. The current malnutrition had been estimated to cost the Pakistan’s economy $7.6 billion (3% of GDP) annually. She emphasized that a multi-sectoral and holistic approach including short term and long term evidence based approaches are the need of the hour to address the current malnutrition emergencies. Pakistan joined the Global SUN (Scaling up Nutrition) Movement in 2013 committing to end malnutrition in the country. SUN Civil Society Alliance Pak is a coalition of over 150 civil society organizations from all federating units, working for the promotion of nutrition agenda and improving the nutrition indicators of the country. The alliance has an active role in mobilizing political commitment for addressing malnutrition at federal and provincial policy level. Dr. Seema Raza, Senior Manager, PPAF thanked the participants for their valuable inputs and joining hands for working together to eliminate malnutrition from Balochistan. She informed the participants that PPAF through its partner organizations has trained more than 450 men and women as community resource persons who have proved instrumental in disseminating nutrition sensitive messages to local community in districts Qilla Abdullah, Qilla Saifullah, Zhob, Pishin, Awaran and Panjgoor. She further said that Media has an extremely powerful and challenging role to play when it comes to disseminating information to the vulnerable sections and catalyzing political ownership to highlight the issue of malnutrition for guiding public opinion and actions for prioritizing the issue at policy level. She said, “We are looking forward to a dedicated collaboration with media, government, SUN secretariat and other stakeholders to end malnutrition crisis in Balochistan”. In the open discussion session, the media participants expressed their resolve for tackling the malnutrition challenge head on. They suggested writing news articles, blogs, and case studies, media feeds on nutrition and food security issues. They said that emphasizing the human side of malnutrition through focused case studies is the way to attract and sustain attention of public and policy makers. A nutrition core group of media persons was formed at the end of the session to develop a single platform for prioritizing nutrition from policy and program levels to community levels. The media persons pledged to use their technical expertise and influence for making nutrition a priority for political commitment, government action and public behavior change. The meeting was attended by journalists from print and electronic media, representatives from Nutrition Cell, P&DD and Health department Balochistan, and civil society organizations.